Just 200 kilometres away from Marrakech, between the sight of Atlas Mountains and the beginning of Sahara desert, Morocco’s greatest effort to introduce renewable energy takes shape. The project to construct a thermosolar plant called Noor (“light” in Arabic) in Morocco got selected in 2011 as part of an investment package from Desertec, with the main objective of promoting the development of power plants in places where renewable resources were more abundant, such as North Africa, and then being able to provide energy to Europe through the Strait of Gibraltar. Noor has been developed in different phases. Stage I started in May 2013, with the installation of half million mirrors covering an area of about 450 hectares and an installed capacity of 160MW. 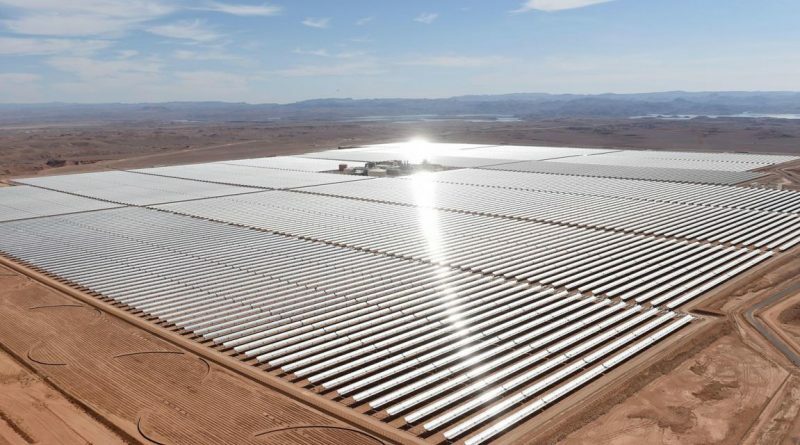 It was finally connected to Morocco’s power grid on 2016, and it’s estimated to deliver throughout the year about 370GW. 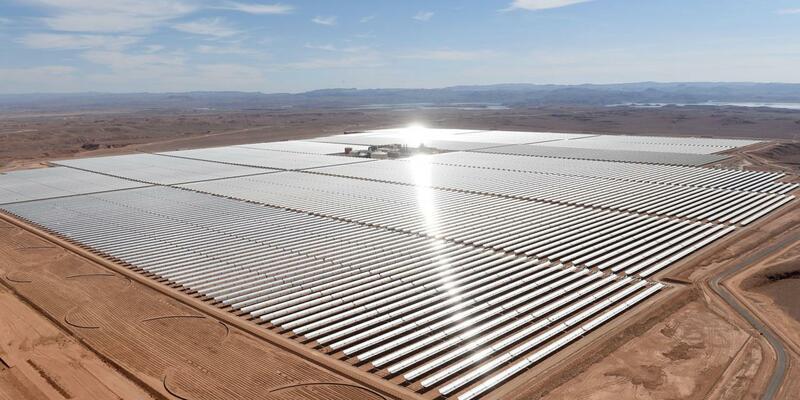 Following stages of the project are expected to be up and running by 2018, according to the head of the Moroccan Agency for Sustainable Energy, Mustapha Bakkoury. When that happens, the total installed capacity will be of 580MW, enough to power over a million homes. Interestingly enough, Noor planners have decided to combine different ways of energy storage in the different stages of the project. For instance, in Stage I and II, mirrors concentrate sun’s rays onto synthetic oil that runs through pipes, and through the heating of it a water vapour is created and gets a turbine-powered generator going. Stage III, however, will use the solar power plant system: all the mirrors will reflect the sun onto a receiver on this tower, and the heat from them will be passed and stored into molten salts, which experts affirm is a more efficient way of storing solar energy, reaching up to 8 hours of energy storage. Water use is another of the issues to face in the implementation of a solar plant in the dessert, and again, planners have given different solutions to the different phases: while Stage I started with a wet cooling system, following stages went for a dry cooling one, in order to save water. However, mirrors still need to be cleaned up regularly in order to maintain an efficiency standard in the energy production, and that’s where the most intense use of water will happen. Morocco has realized the importance of this strategic sector and is determined to make the best out of this comparative advantage. Until recently, the country imported 97% of its energy needs, something absolutely unreasonable when considering that Morocco has one of the world’s largest potential for solar power production, with up to 3,600 hours of sun in the desert. Now, a new trend of investment in renewable energy is dominant: 34% of the country’s electric power production comes from renewable sources, mainly hydro, wind, and solar. Its plan is continue on this path, estimating a generation of 42% from renewables by 2020, and 52% by 2030. The implications of their approach to this opportunity are of great importance, not only for their own economy, but for the African continent as a whole. The fact that the country with the closest links to Europe takes the lead and develops diverse energy strategies, thinking on its own energetic needs but also on the European market, can produce drag effects on many other African countries, that potentially could become exporter of power supplies to Europe, as well as amongst themselves. Countries like Ghana, Rwanda and Congo are already investing in solar power projects. It could be the beginning of the new era of clean energy production in Africa, and Morocco is decided to spearhead the change.